The MUT68 is a 6'8'' straight blade plow that brings the reliability and quality of SnowDogg to UTV's. It is great for campus and grounds crews that need to clear small parking lots and tight walk-ways. Additionally, its weight is optimized to be able to work with most full-size UTV's. Works very well in tight spaces and is great for stacking snow. SnowDogg UTV plows are equipped with 14ga brush finished 304 stainless steel, 4ga power wires, and handheld controllers with integral diagnostics. Compact lift frames and fast acting hydraulics provide great maneuverability and efficiency while plowing or stacking snow. Great in Tight Spaces:A narrow 69'' width allows you to be able to easily maneuver in tight spaces. Smooth Plowing:A full trip edge design provides a very smooth plowing experience. Optimized Weight:The weight of the plow is optimized to work with a majority of full-size UTV’s. Equipped With:14ga brush finished 304 stainless steel and 4ga power wires. Easy Snow Stacking:6'' lift cylinder and 35° travel provide excellent snow stacking ability. Handheld Controller:Handheld controller with integral diagnostics. Fast Acting Hydraulics:Fast acting hydraulics allow for quicker operation. 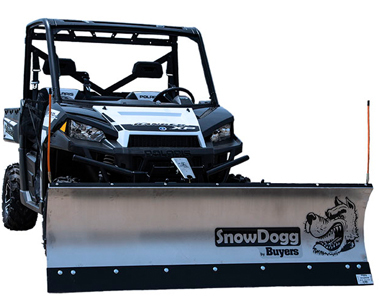 Ask us about the SnowDogg MUT68 80'' UTV Straight Blade Snow Plow. Please no repair questions. Your Q&A may be posted to SnowblowersAtJacks.com to help other shoppers, like you, with their purchasing decisions. Thank you.